So you want to learn how to dive? Getting certified to dive will be one of the greatest learning experiences of your life. First, there's the excitement of learning to explore a new world, one of those adventures that have the power to re-energize us, to burn off the rust we accumulate in our adult lives and make us kids again, when the learning came fast and furious. But as adults we also appreciate the seriousness of the commitment we make to become certified divers, a commitment not to be taken lightly. It all starts with one person: your dive instructor, the person saying welcome to this new world, you're gonna do fine. The person in whose eyes you search for the confidence and assurance you need as you begin to submerge for your first open-water dive is a moment that captures the special faith we place in dive instructors. Good news: If you're reading this, you've probably already taken the first step to becoming a certified, active diver. This class is offered in three phases: Phase One is the E-Learning / Academic portion online training. Phase Two is the swimming pool training to master the skills needed for the open ocean. Phase Three is the open water and ocean diving. The classes include all academic instruction, pool instruction and open water dives to produce comfortable, knowledgeable and independent divers. The classes also include instructor fees and of course your Certification Card which is recognized worldwide from Scuba Diving International (SDI). Total Cost is $449 including the rental of the SCUBA equipment. This includes everything except your soft gear. (Mask, Snorkel, Fins, Boots and Gloves). For new students, we offer the lowest prices on equipment. Riverside Scuba Locker will BEAT ANY PRICE ON THE INTERNET...GUARANTEED ! Many divers find that night diving is their favorite type of diving. As with all specialty diving applications, procedures are different than those associated with Open Water Diving. The purpose of the SDI Night & Limited Visibility Diver course is to acquaint the Open Water Scuba Diver with the procedures, techniques, and potential hazards associated with diving at night or in limited visibility. By becoming familiar with the use of dive lights and night diving techniques such as navigation. You will be able to enjoy night diving with maximum safety and comfort. The SDI Rescue Diver Course is designed to develop your knowledge and necessary skills to effectively perform diver rescues and assist, and administer necessary first aid. You will learn skills such as how to perform self rescues, buddy rescues, recognize and calm potential panic divers, administer proper first aid to divers that have experienced dive related injuries, conduct effective search patterns and manage accident scenes. After the SDI Rescue Diver Course you can enroll in the SDI Master Scuba Diver Development Program or start in the professional ranks and sign up for the SDI Divemaster Course. The SDI Advanced Diver Development Program was created to make truly “Advanced Divers”. During the course your SDI Instructor will take you through four SDI specialties (deep diving, navigation, night diving, nitrox, wreck, etc. as examples) covering all the skills and subjects, so that by the end you will feel comfortable to conduct dives of a similar nature. Once you have logged your 25th dive (these can included any and all training dives) visit your local SDI facility with your logbook and four SDI Advanced Diver Development specialty cards and you will be awarded the SDI Advanced Scuba Diver certification. By earning the SDI Advanced Scuba Diver certification you will increase abilities and comfort in the water and be ready for the next step, SDI Rescue Diver. This course is intended to introduce you to each of the five (5) specialties . One (1) dive from each of the chosen specialties may apply towards a complete specialty certification. You have already shown that diving is the sport for you by completing your Open Water Scuba Diver certification, Advanced Scuba Diver certification, Rescue Diver certification and you have logged 50 total dives, now take the next step. The SDI Master Scuba Diver Development Program is an earned certification and the highest non professional level of certification. Visit your local SDI facility and bring along all your accomplishments in diving, remember to bring your current logbook with your 50 logged dives.The friendly staff will reward all of your hard work by submitting for your Master Scuba Diver certification. So now that you have earned the highest of non professional training what’s next? You can continue to take SDI specialties that interest you like Computer Nitrox, Diver Propulsion Vehicle Specialty, Dry Suit Diver, and many more or sign up for the first professional level of training SDI Divemaster. Once you have completed your Divemaster training, the next step is to become an Assistant Instructor. This is a prerequisite for the coveted Scuba Diving Instructor License. 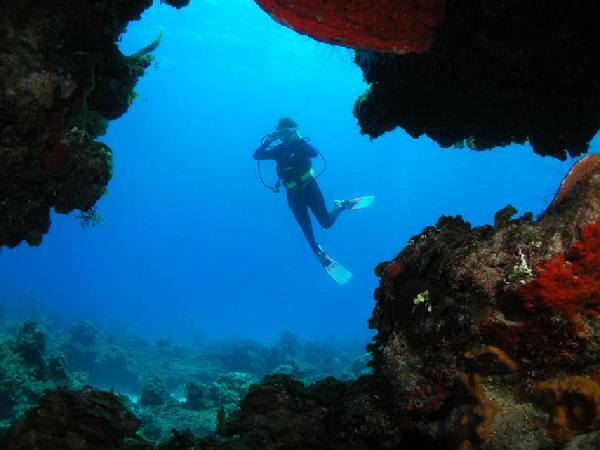 A career in scuba diving may be perfect for you! The IDC (Instructor Development Course) is the ultimate goal in scuba diving. Contact us for class details and dates. AND MANY OTHER SPECIALITY COURSES ARE OFFERED. PLEASE CONTACT THE SHOP FOR MORE INFORMATION. 1043 W La Cadena Dr.